In the early 21st century Dizarh Architectural Studio was created, devoted to a cause that would bring both inner satisfaction to the architects and benefits to society. Dizarh agreed that their mission is to break stereotypes through fresh, different and bold approaches, expressed in aggressive, determined and memorable solutions. They believe that they can overcome established limits through a creative and innovative spirit. Despite the comparatively short history of the Studio, their projects have covered a wide range of serious architectural challenges - from small, elegant edifices for private clients to large public projects. They welcome these challenges in a new way - their way, that is - living and enjoying every step of this creative process they believe that they change and create new dimensions within their environment. The successful way in which they have realized and keep realizing their professional standards in Bulgaria has encouraged them to apply for and compete in a number of European and worldwide contests with their projects, some of which they present here. The idea of a Museum of World War II intertwines the threads of life, occupation, war, wounds and death. The design of the museum demonstrates the innovative and aggressive approach to the creation of forms, which corresponds well with its functional purpose. The coarse severed blocks are reminiscent of the World War II devastations, as if at any moment ready to press the visitors down. The large panels of the museum are breached in places which allows the sun to pierce through the holes, creating its own dappled compositions on the floors of the premises. The façade is riddled in various places, referring to the swastikas used by the Nazis, and reinforced by layers of rust on top of the shutter blinds. 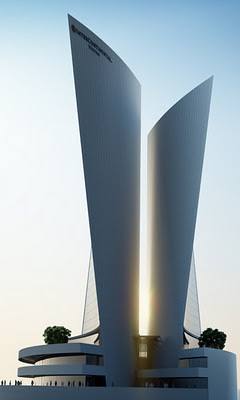 The proposed concept for the Intercontinental Hotel in Yerevan, Armenia, consists of two bodies with a refined silhouette, explicit enough to loom against the horizon. The selected materials promote the image aimed at customers seeking the highest quality, good standing and a unique experience. Elegant and aggressive, the location of this dual structure emphasizes the innovation of the concept, offering stunning views from all sides. The Research Centre has expressive and emblematic radiation, which emphasizes the importance of the edifice against the overall urban planning concept of a new scientific and university complex in Belgrade, Serbia. The proposed project includes two bodies made of materials whose combination, interaction and colour create a sense of dynamism and vitality. It is this combination that inspires and evokes the visitors' interest in science and education. The focus of this spatial structure is the sharp ending that stretches to the horizon and draws inwards the pixelated glass sphere; the planetarium, which frames the core of the building. The different design of the villa, which is situated near the town of Varna and is still under construction, contributes to two main objectives - to create a sense of harmony with the environment and, at the same time, a sense of a residence of the highest standing. The modern concept presented here reveals a careful choice of materials and colours that blend naturally with the surrounding scenery. The extensive glass area allows for the tangible combination of sun and shade, which makes this solution suitable for clients seeking close contact with nature.